In 2013, the director of Hunter Writers Centre and a palliative care nurse specialist, who also loved to write, dreamed up the idea of calling for stories and poems to publish for Grief Awareness Month (August). 6 years later and we are excited to publish another collection of your work this year. Each year, Australians living here and abroad submit poems up to 36 lines or stories/personal essays up to 500 words and approximately 110 works are published in the annual anthology. The 6th anthology was published in 2018. 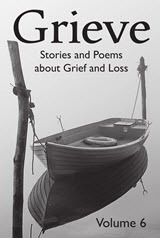 There is now a dedicated Grieve Project website where people around the world can read the wonderful writings by Australians. The competition opens on Valentine’s Day each year, closes in May and the book is launched during August along with a live reading online of the top 20 works selected by the judges. The team of judges come from all fields – grief and loss industries as well as from the literary world. The prizes are kindly donated by organisations and individuals. Would you like to donate a prize in memory of a loved one or colleague? Did you know, for every 1 suicide there are 5 suicide attempts?